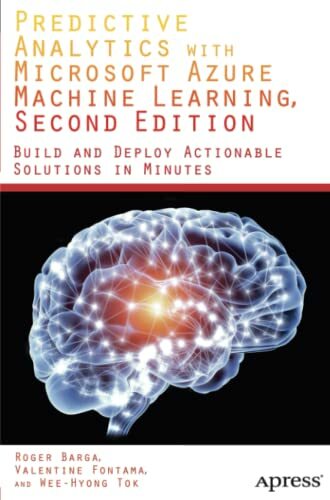 Predictive Analytics with Microsoft Azure Machine Learning, Second Edition is a practical tutorial introduction to the field of data science and machine learning, with a focus on building and deploying predictive models. The book provides a thorough overview of the Microsoft Azure Machine Learning service released for general availability on February 18th, 2015 with practical guidance for building recommenders, propensity models, and churn and predictive maintenance models. The authors use task oriented descriptions and concrete end-to-end examples to ensure that the reader can immediately begin using this new service. The book describes all aspects of the service from data ingress to applying machine learning, evaluating the models, and deploying them as web services. Learn how you can quickly build and deploy sophisticated predictive models with the new Azure Machine Learning from Microsoft. Valentine Fontama is a Principal Data Scientist in the Data and Decision Sciences Group (DDSG) at Microsoft, where he leads external consulting engagements that deliver world-class Advanced Analytics solutions to Microsoft’s customers. Val has over 18 years of experience in data science and business. Following a PhD in Artificial Neural Networks, he applied data mining in the environmental science and credit industries. Before Microsoft, Val was a New Technology Consultant at Equifax in London where he pioneered the application of data mining to risk assessment and marketing in the consumer credit industry. He is currently an Affiliate Professor of Data Science at the University of Washington. In his prior role at Microsoft, Val was a Senior Product Marketing Manager responsible for big data and predictive analytics in cloud and enterprise marketing. In this role, he led product management for Microsoft Azure Machine Learning; HDInsight, the first Hadoop service from Microsoft; Parallel Data Warehouse, Microsoft’s first data warehouse appliance; and three releases of Fast Track Data Warehouse. He also played a key role in defining Microsoft’s strategy and positioning for in-memory computing.Val holds an M.B.A. in Strategic Management and Marketing from Wharton Business School, a Ph.D. in Neural Networks, a M.Sc. in Computing, and a B.Sc. in Mathematics and Electronics (with First Class Honors). He co-authored the book Introducing Microsoft Azure HDInsight, and has published 11 academic papers with 152 citations by over 227 authors.